Between the Loire (6km), Vienne (3km) and Indre (6km) in this corner of Touraine called the "VERON" which will delight fans of walks or bike (circuit "Loire bike" 150m ). Nearby among other castles of Chinon (8km), Rigny Ussé (8km), Rivau (10km), Montsoreau (8km), Langeais (25km), Azay le Rideau (25km) Saumur (20km), the Abbey of Fontevrault, the city of Richelieu (20km) and the heart of the vineyard of Chinon, near those of Bourgueil, Saint Nicolas de Bourgueil, Champigny, Saumur and Layon. Ground floor: 27m² lounge (sofa, TV), kitchen 14m (washing machine, dishwasher, microwave, induction hob, oven), bathroom, toilet. Floor: 1st bedroom (2 beds 1 person joinable 80x200, wardrobe) 2nd bedroom (2 beds 1 person joinable 80x200, wardrobe) 3rd bedroom (1 bed 1 person 80x200), bathroom, toilet. Note: A deposit of 300 € in cash or check will be requested at the entrance to the cottage and will be returned (except damage) to your departure. We had a brilliant stay in this very well equipped and homely property. The hosts were exceptionally helpful and even fixed a puncture in one of the bikes we were loaned by them (we only asked if there was a bike pump we could borrow to do it ourselves!). Beautifully furnished, everything you could need. We are a family of four (two teenage sons) who have just returned from a 2 week holiday in France. We wanted to locate ourselves for our first week in the Loire Valley and then move onto The Dordogne region for our second week. La Bonne Oats suited us down to the ground and Rene and Nicole couldn't have been more helpful. During our stay we were lucky enough to have wonderful weather and Rene and Nicole made sure we had fans for the house which we could move around as we needed. They also allowed us to use 4 bikes which enabled us to make use of the very well marked cycle routes down to and along the Loire Velo Trail which was well worth it. The property itself was spotlessly clean and very well equipped - decorated to a high standard with a thoughtful layout. Despite our French being pretty bad and Rene and Nicole claiming their English wasn't very good (much better than our French!) we all managed to understand each other and we enjoyed a home made aperitif together on our last night with some help from google translate! We found the location of the property really useful. Not only were we handy for the middle of Avoine and its bakery and Carrefour supermarket - (literally a 2 minute walk away) but the property was private, peaceful and had plenty of outside space which made it very relaxing. From Avoine we reached Montsoreau (for its market and river beach),Zoo Parc de Beauval (just 1 1/4hrs) which was a very good zoo with the animals looking very well cared for and of course we got to see the Pandas and Hippos!. Saumur was only 20 minutes away - a very picturesque town with lots going on there to see and do - Loire cruises (nice 50 min cruise with a tasting session of local sparkling wine and biscuits! ), bike hire, Chateau and not too far away Kayak hire among other things. Chateau de Chenonceau was only 50 mins away also which was very pretty and you could also incorporate Chateau Villandry and its wonderful gardens in on the same day. Rochmemenier Troglodyte Village was 1/2 hr away. Along with lots of well signposted walks, bike routes and sunflower fields there was something for us all. Couldn't fault the property, area or Rene and Nicole's hospitality. 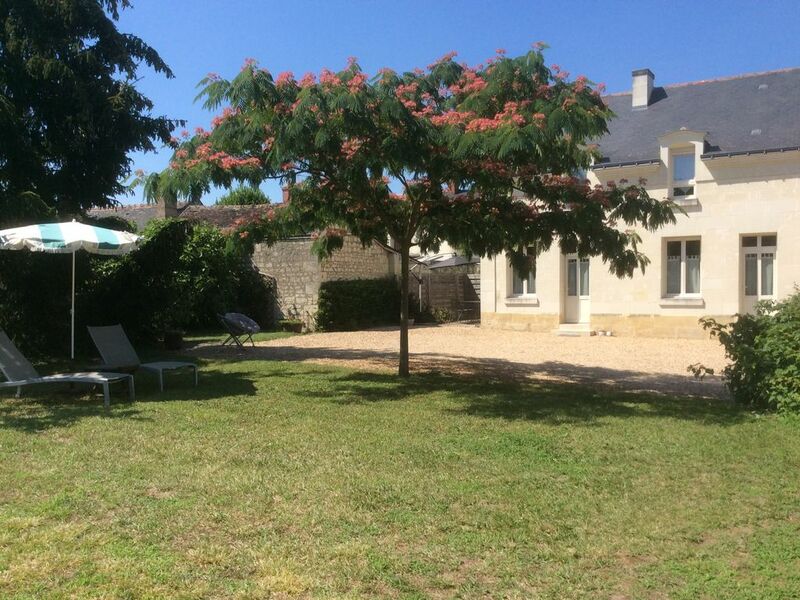 La Bonne Avoine (= The Good Oats) is a stylishly converted house right in the heart of the town of Avoine but in a quiet location with nice private gardens. It is well furnished, having a double, a twin and a single bedroom plus bathroom (with shower) upstairs and a nice sitting/dining room and kitchen and extra toilet and shower room downstairs. There is a washing machine and drying stand and the kitchen has a dishwasher, oven, ceramic hob, coffee machine for filter coffee and a kettle and plenty of cooking utensils and crockery and cutlery. We spent a very enjoyable week visiting local attractions such as Chateau Chenonceau, Abbaye de Fontevraud, Chateau d'Azay-le-Rideau and the gardens of Chateau de Villandry, which are all in easy distance from Avoine. The city of Chinon is attractive and offers lots of shopping and eating out opportunities and is only 15 minutes by car. Avoine itself has lovely flowers in the centre and there is a Carrefour supermarket, a bakery, post office, pharmacy etc in 5 minutes walking distance from the house. The owners Nicole and René Vineau made us very welcome and live close by and quickly resolved a problem we had with the hot water supply. We can highly recommend La Bonne Avoine to anybody wishing to stay in this area. Séjour calme, confortable, à l'aise, "La bonne Avoine", un gîte de référence. Quelques jours au gîte de "La bonne Avoine", dans un confort remarquable, au calme, une cour privative, une maison magnifique régionale, c'est un rêve que nous renouvellerons. Des propriétaires sympa et dynamiques, ce qui ne gâche rien. Que du bonheur !! !